After finishing in Andermatt in 2000 when cycling to visit Irene in Zürich, I decided to continue from where I left off and continue on towards Spain. I would keep on cycling until I ran out of time and then catch the train back. Little did I know when I started that I would end up cycling down deep into Italy and away from Spain. That was a spontaneous decision half way in the trip. 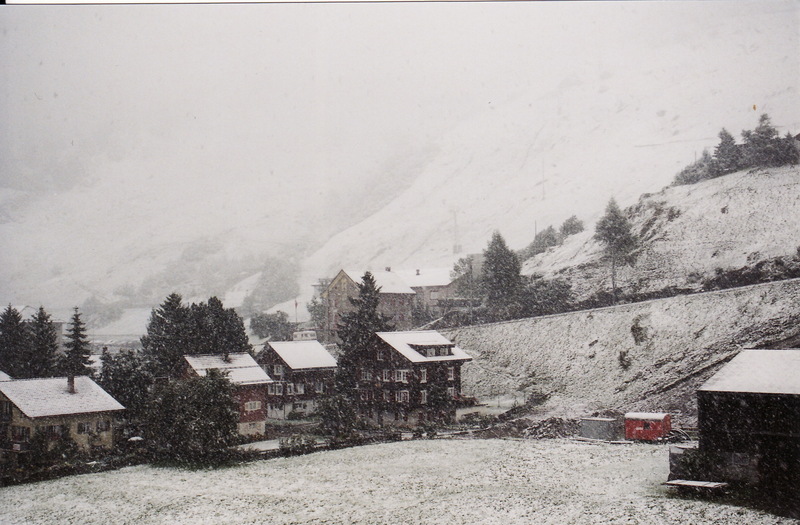 When I arrived in Andermatt in the train, I was worried that I may not be able to even start the trip. Everything was covered in a blanket of white and it was snowing. 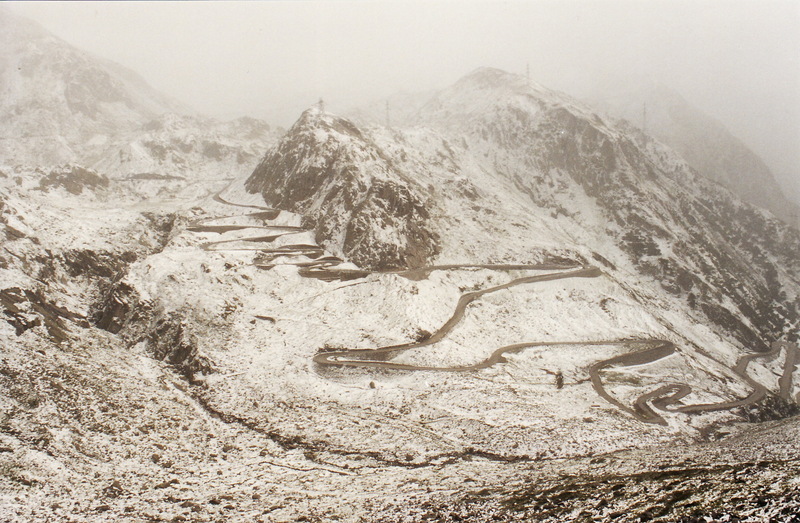 Last year the Gottard Pass was closed when I arrived in Andermatt. At this time of year, it was meant to be open. The next morning I checked at the hotel. It seemed the pass should be open and safe. I put on all the layers of clothes that I had and slogged slowly up the mountain. It was snowing and cold, but the pedaling uphill kept me warm. It was a beautiful white fairytale landscape bathed in a mysterious fog. I reached the top and posed for a photo opportunity. My multiple layers of clothes gave me a bit of a stomach, which my vanity requires me to mention at this point. 🙂 Icicles were hanging from the signpost and it was very cold. The top of the Gottard pass. It was cold. The trip down the mountain was desperately cold. I was not moving but just sitting in the icy wind as I scooted downhill at between 40 and 50 km/h. I had to stop periodically to thaw out my hands on my somewhat warmer stomach before pushing on. The alternative (closed) road down the Gottard pass. Still, the cold didn’t last, and before long the snow had gone, the sun was out, and I peeled off layer after layer until I was in my shorts sleeve summer gear and sweating. The weather was completely different. The alps lived up to their reputation of being the border between different weather patterns. Veloland 3 bike route continued down a beautiful valley which I followed hardly pedaling at all, redeeming the hard fought metres in altitude I had gained. Passing the famous Italian lakes I slipped down into Italy. Warm, sunny weather to the south of the pass. The Po plains are flat, industrial and ugly. And the sun was glaring down and it was hot. I did my best to keep off the main roads. I knew on the map where I wanted to go, but it was hard to find my way out of villages on the right roads, and I kept ending up on main roads. I avoided Milano, but not some other main towns and some busy and unpleasant roads. Finally I found where I was and took the main road to Pavia, and put my head down and flew along. Get to Pavia, find a hotel, and sleep. The next day I would leave the plains and it would be nicer. That day was September 11 2001. In my sprint to Pavia before nightfall my mobile went off again and again. It was my ex-boyfriend ringing me. I kept on blocking the call. Finally I answered. Two planes had crashed into the twin towers in New York and they had come crashing down. What??? In Pavia I drifted down the shopping street peering into shop windows where the television was running. I spoke to people and got the global story of what had happened. Not speaking much italian was a bit frustrating then. I couldn’t buy any papers or listen to any news for more information. This wouldn’t have been a problem now that the digital age has set in well and truly. In Pavia I planned my next day’s trip. Judging on the distance travelled on the Po plains, I made plans to head off deep into the mountains before the coast, in the direction of France. I had a village targeted for my next night’s lodgings. This was the fateful day when I decided to cycle to the south of Italy rather than the south of Spain. It was hot, the sun was bright, and the mountains were steeper and slower going that I had thought. Time was getting on, I was getting tired, and I was nowhere near where I needed to be to reach the planned town by nightfall. 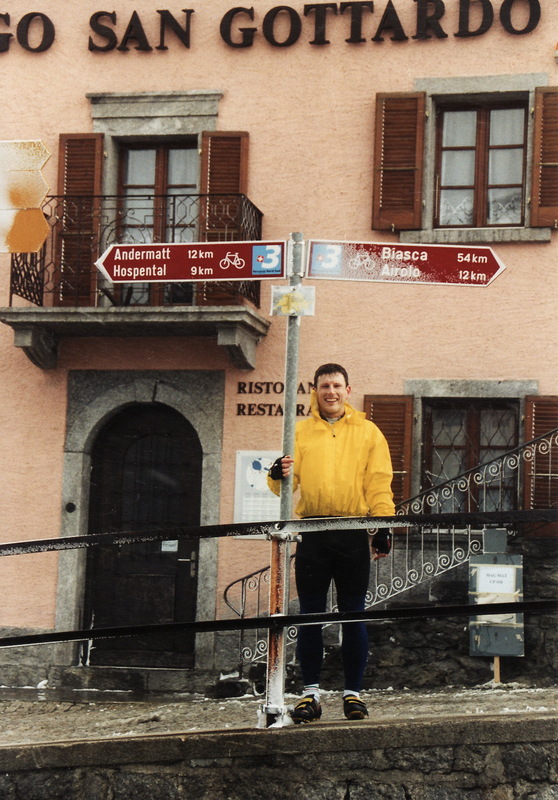 The nearest place to stay was Bobbio. 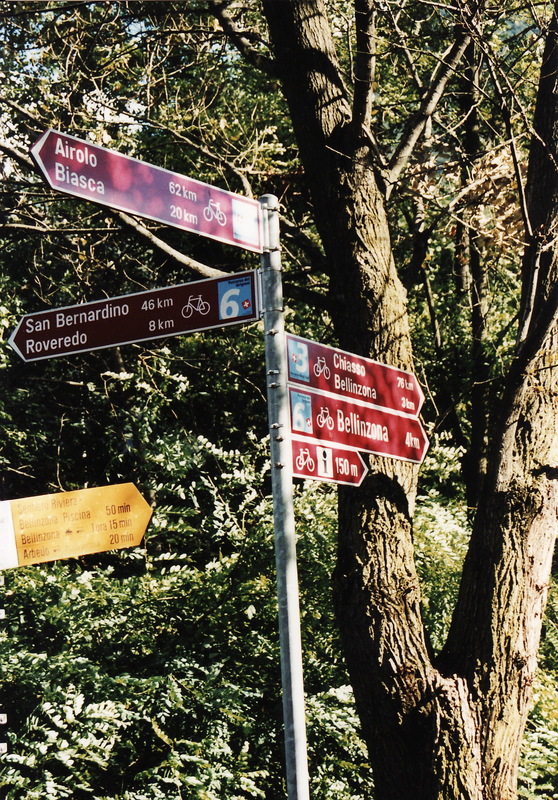 The problem was, Bobbio was clearly in the wrong direction. I was hot, tired, and fed up. Italy would be nice to cycle through too. Bobbio it was. 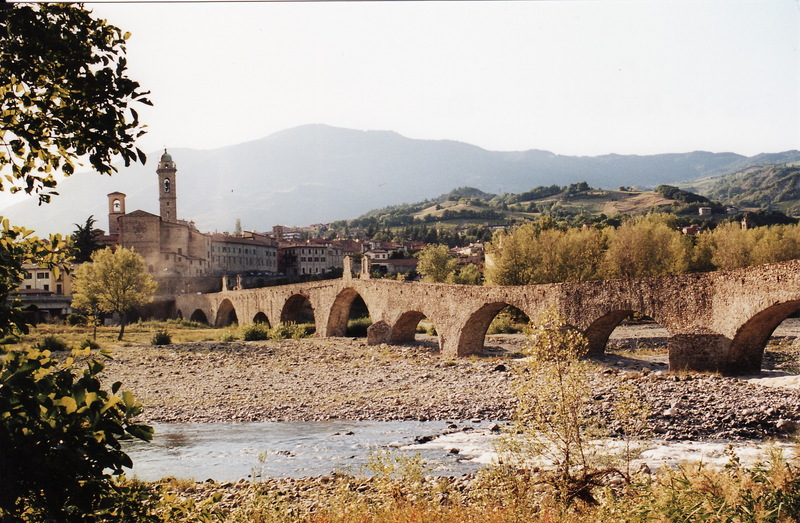 And Bobbio was a lovely old village with a beautiful bridge over a river. I had an early stop there and planned the next day’s trip… down deeper into Italy. Beautiful scenery. Rolling hills and little farm villages. 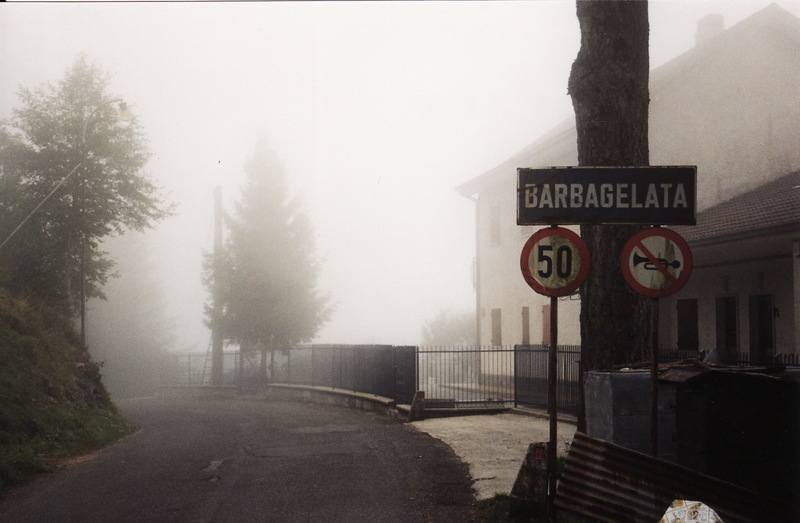 I passed through Barbagelata and over the Passo de Scoglina which was high in the clouds (and a lot cooler). Then down to the coast: a very beautiful coast between Genova and La Spezia. I followed the coast, up and down over little passes, spectacular views over the coast, and down into La Spezia. The last stretch along the coast from La Spezia to Pisa was very bland. A continuous village of holiday apartments going on and on for ever. Then, on the last stretch into Pisa I got a flat tyre, and it started to pour with rain. Hungry, tired, and wet, I was unable to change the tyre after several attempts. Disheartened and bedraggled I wheeled the bike the last 5 kms into Pisa, found a hotel, ate something and went to sleep. The next day was magic weather and I did the tourist sights of Pisa. The leaning tower was not standing alone as I had imagined but was snuggled in amongst a stash of other impressive buildings. I took all the necessary photos, went on a pleasant walk through the town, and then caught the train back home. The trip was continued in 2002. 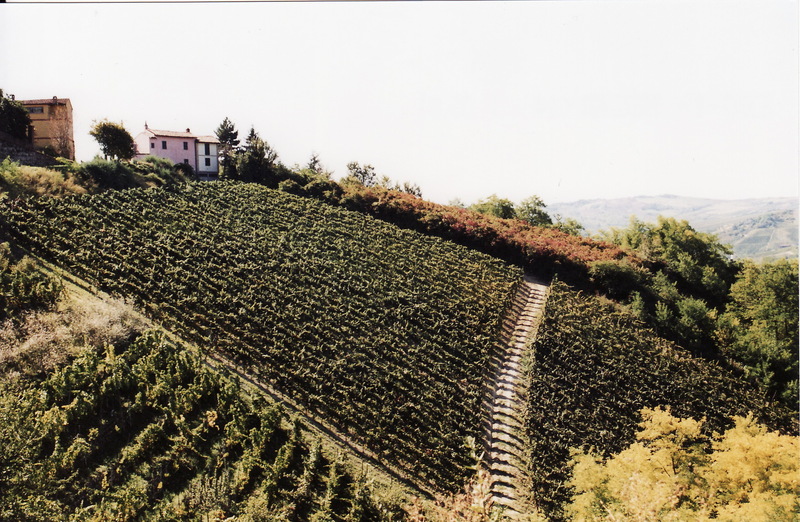 In Italy in particular, it is important to follow bike roads – otherwise you end up on main roads. After Rome, we made our way to Naples. The route I uploaded on my blog was only approximately the route I took in the area near Naples, as I have lost the paper map with the detailed route. Other than that, the route I displayed is the route I took. There are, however, probably nicer routes. I am not a local there and didn’t find them.. If you are going to Naples, do cycle a bit further to the Amalfi coast. Very beautiful!